May is my favorite month of the year: the flowers are blooming, the birds are chirping, the bees are buzzing, and the grill is sizzling. And hey, it's also National Beef Month. For smoky flavor, charcoal is great. But for cooking speed, you can't beat a gas-powered grill. There's no smelly lighter fluid, no coals heating up in a chimney, and no waiting around for the coals to reach just the right temperature. With Memorial Day right around the corner, here are eight tips for cooking meat on a gas grill. #(clear n1). Clean your grill. Remove any leftover food residue by heating the grill on high with the lid closed for a few minutes. After the grill has heated up and the smoke has settled down, scrub the grates clean with a grill brush. Once the grill is clean and hot, turn the flame down. When grilling something lean, oil or season the grill first. Use an oil with a high smoke point, like an extra-light olive oil or a refined canola oil. Apply the oil to a paper towel and use the grill brush (not your hand!) to rub the oil on the grates. If I’m grilling a prime beef steak, however, I let the fat from the steak season the grill. #(clear n2). Buy good meat. When I’m in the mood to grill beef, I look for cuts from the rib and the loin, or the flat-iron steak. I like prime and high choice beef for the internal marbling. My guiding principle in selecting beef is the proof of deliciousness: if marbling equals fat, and fat equals flavor, then marbling equals flavor. If you prefer grass-fed beef, try thicker cuts (1½ to 2 inches thick) and slice them thin to serve (see tip 8, below). Or try ¾- to 1-inch-thick steaks, and grill them atop a Himalayan salt block (see tip 6). #(clear n3). 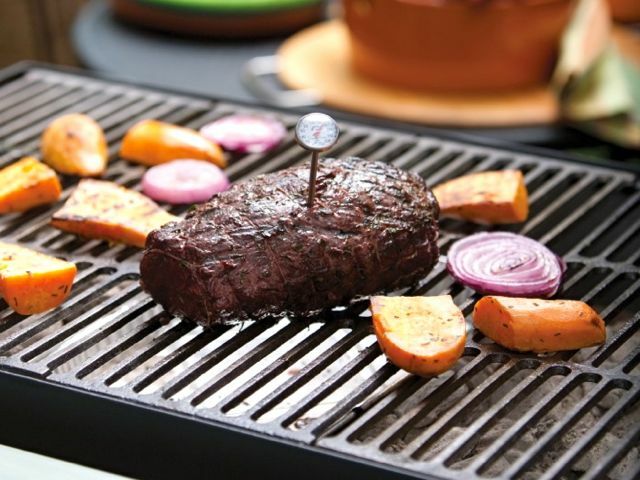 [%image meat float=right width=300 caption="A meat thermometer is key."] Marinate your meat. Marinades are a quick and easy way to tenderize meat and enhance flavor. Foods containing acids (citrus juices, yogurt, wine) or enzymes (fresh ginger, papaya) soften proteins. Meanwhile, spice rubs and pastes add flavor. I like to use a little soy sauce, some oil, and some black pepper to perk up flavor. Flat cuts of meat, such as flank steak, benefit the most from marinades, since the liquid penetrates only about ¼ inch into the meat. The simplest application method with a marinade that involves some liquid is to use a heavy-duty zip-top plastic bag. Use no more than ¼ to ½ cup of marinade per 1 to 2 pounds of meat, and squeeze out as much air as possible from the zip-top bag to ensure the marinade makes contact with all surfaces of the meat. For tenderizing, the meat should marinate for at least 6 hours, up to 24 hours maximum (to avoid a mushy texture). For flavor, the meat can marinate 15 minutes to 2 hours. Sometimes I season and lightly marinate the meat right in the paper it was wrapped in. I simply sprinkle the marinade right over the steaks on the paper, then flip them halfway through the desired marination time. If you want a sauce with the same flavors as the marinade, reserve a portion of the marinade before it comes into contact with the raw meat. Always pat the meat with a paper towel to remove excess marinade. This step prevents the meat from steaming when it hits the grill, which will result in a tough texture. #(clear n4). Use a thermometer. The biggest mistake even the most experienced grill mistress (or master) can make is to overcook that costly steak. Some thermometers come with a degree-of-doneness alarm, which is perfect for our distracted lives. Place the thermometer in the center of the thickest part of the steak, and avoid touching bone, fat, or gristle, as those can make the reading inaccurate. Remember to set the alarm 5 to 10 degrees below the desired internal temperature, as your steak will continue to cook after you remove it from the grill. #(clear n5). Do the two-step. A technique commonly used by chefs, the two-step is a quick cooking method where steaks are first seared in a pan and then finished in the oven. This process allows for even cooking with restaurant-quality results. I use this technique on the grill, and you should, too. Adjust your preheated grill temperature to medium and prepare it for two-zone cooking by turning one of your burners off so you have a cooler side of the grill to use after searing the steaks. Start your steaks — tenderloin, rib-eye, or top loin, cut 1¾ to 2 inches thick — on the hot side of the grill to sear for flavor. Turn them once with tongs. (Never use a fork to flip your steaks, as the fork will pierce the meat, letting the tasty juices run out and away.) Move them to the cool side and close the lid. 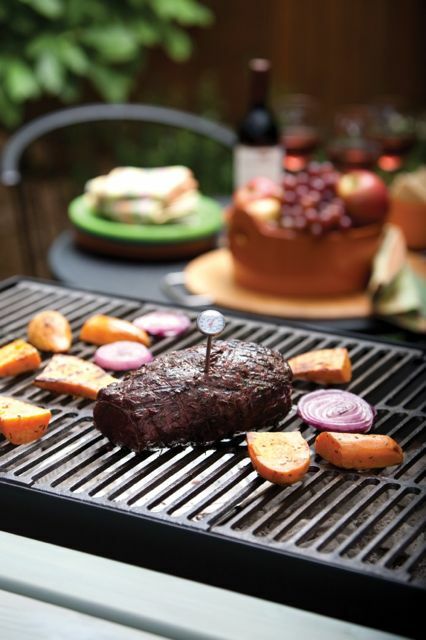 Be sure to use your thermometer (see tip 4) to check the steaks' internal temperature for doneness. For medium rare, grill steaks for about 10 to 12 minutes, or until their internal temperature is 125 degrees. For medium, grill 13 to 15 minutes, or until their internal temperature reaches 135 degrees. I also use this technique for small roasts (1½ to 2 pounds) from the sirloin, top loin, or rib-eye. It's important to heat the salt block slowly and gently to prevent cracking. Place the block directly on the grill. Heat it on low for 15 minutes, then on medium for another 15 minutes, and finally on high for the last 10 minutes. If I’m cooking thick steaks, I place them on the block to sear for just one or two minutes, remove them, and then place them on the grill grates to finish cooking. For thin steaks, I cook them entirely on the salt block. I use my Himalayan salt block to grill everything from filet mignon to flank steak to shrimp and even chocolate for dessert. Clean-up is a snap: I just let the block cool to room temperature, rinse it with warm water, scrub it clean with a scouring pad, and pat it dry. #(clear n7). Rest is always best. After I cook steak, I let it rest for about 10 minutes on a wooden cutting board with a groove around the edge to collect any juices. The meat will continue to cook another 5 to 10 degrees after being removed from the grill. And as the fibers of the meat cool, they relax and get stronger, thereby better retaining the juices. If cut too soon, the steak’s juices will come flowing out. #(clear n8). Slice to serve. If you have a grill that doesn’t cook evenly or steaks that aren’t perfectly cut, achieving grilling perfection can be an elusive goal. But don’t panic, because you can save it all in the final step: presentation. The best way to present a great steak meal from the grill is to slice the meat before serving it. If you have friends and family like mine, sometimes fat can be a big turnoff. Guests sometimes end up wasting half the steak you cook for them because they’re trying to avoid the fat. So first I use a sharp knife to remove the unwanted fat. Then I cut the steak into slices and place the slices on a serving platter, arranged by degree of doneness. Guests can then pick the slices they want — and everybody's happy. p(bio). Based in Chicago, Kari Underly is the author of the 2011 book The Art of Beef Cutting, which was nominated for both a James Beard Award and an IACP award. A third-generation butcher, she is the founder of Range, Inc., a meat-industry consultancy. Find her on Twitter @kariunderly.